Paragon is delighted to announce that Joseph Morabito, Founder and CEO of Paragon Global Resources was recently named International Relocation Personality of the Year by Re:locate magazine. 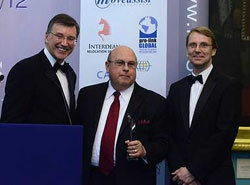 Morabito was nominated for his entrepreneurial spirit and long-term service to the global relocation industry. With more than 32 years of experience, his entrepreneurial solutions and visionary approach have made a significant impact on the relocation industry. When accepting his award, Morabito thanked his staff saying, "I appreciate the recognition. But individuals don’t win awards, teams do. It’s the people at Paragon who won this." View the video of Joseph Morabito accepting his award. Paragon Relocation was also honored in the highly commended category for Relocation Provider or Team of the Year for their implementation of a large scale, complex global relocation program. Paragon was a single source solution to replace four separate global relocation service providers. In just three months, the implementation – involving more than 50 client Human Resources managers from all over the world – was complete. Logistically, client users were spread over 82 different countries. Financially, services were billed in 22 different currencies. Paragon worked quickly and effectively with the client to bring synergy to the group and to bring all the pieces of the program together successfully. Re:locate is a European-based publication that caters to the global mobility industry. 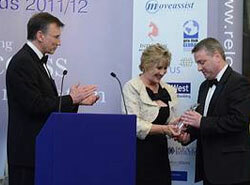 The annual awards gala was held on May 10, 2012 in London. Paragon Relocation is the premier partner of choice in the Global Relocation Management industry providing innovative programs, value-added support, superior customer service and thought leadership to our clients and the families we relocate. Our mission is to provide an extraordinary customer experience, one family at a time. Paragon Relocation has been providing relocation services for 25 years and offers services in 150 countries.